Our Petite Medical ID Tag with durable 316L Surgical Stainless Steel curb link bracelet (approx 4mm width), two stainless steel lobster clasps hook onto your medical id tag allowing you to change your bracelet to suit your style! No further discounts on this laser engraved product. 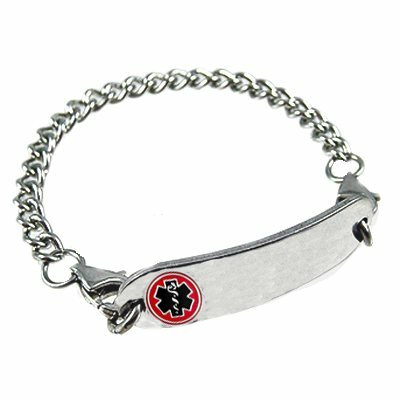 Price includes Petite stainless steel medical ID tag bracelet with laser engraving, interchangeable chain and two lobster clasps. Sizing: Take a snug wrist measurement, (no wiggle room) and add 3/4 inch in this smaller chain style.